Jimmy Carter got mail in 1977 While running for president in 1976 Jimmy Carter mentioned his 1969 UFO sighting which he reported to the International UFO Bureau in 1973. Later in the campaign he stated he would, "make every piece of information this country has about UFO sightings available to the public and scientists." After he was elected approximately 10,000 letters arrived at the White House calling on the new President to follow through on that promise. This created quite a stir and prompted the Carter White House to sign off on two extraterrestrial studies - both of which were resisted and quietly shut down by the Department of Defense and other agencies. The Cold War would not be over for another 14 years. It was too soon. If 10,000 letters in 1977 launched two ET studies, what might 1 million letters, faxes and emails in November of 2008 accomplish? 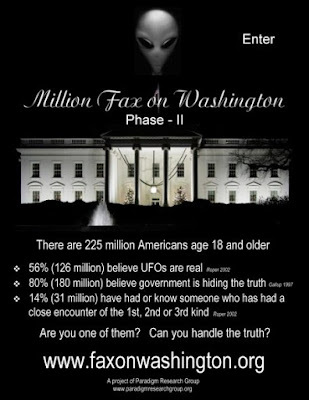 Purpose for the Million Fax on Washington Formal acknowledgement of an extraterrestrial presence engaging the human race - Disclosure - is close at hand and already under consideration by elements within the United States Government. But it is not a fait accompli. It could be withheld due to events or loss of political will. It is critical the American people act in concert now to help close the deal. There has never been a more profound opportunity for you to make a difference and change the course of history. How You Can Do It It is a well understood fact the first 100 days of a new administration are the most important. Between January 20 and April 30 - one hundred days - send a letter, fax and/or email to the White House calling for President Barack Obama to end the Truth Embargo regarding an extraterrestrial presence and release as much relevant information to the American people as possible within reasonable constraints of national security. You won't be alone. The goal is one million. Why You Should Do It 1. It is time for the people to know the truth about the world they inhabit. 2. Maintaining the Truth Embargo has cost a fortune, undermined the social contract, and led to abuses of secrecy and power. 3. Until this Truth Embargo is ended there will be no public access to technologies derived from ET vehicles at a time of mounting economic and environmental challenges. What you should know 1. Letters are best (all are opened, all are read), Faxes are next best, Emails are third best but more powerful under this administration which is calling for email input via the website. 2. If you really want their attention, sign it with your name, address and phone number. 3. Scripted submissions are not as effective. Write it your way. 4. Brief is better, but make your point. 5. Important.The soonest after the inauguration you can send your letter the better. 6. The White House contact information is provided below. 7. Important. Please notify Paradigm Research Group at [email protected] when you send a letter / fax / email to the White House This will help PRG to generate media interest in this effort. Basic points to draw from for your letter, fax or email President Obama should: 1. demand and receive a full briefing by his military services and intelligence agencies regarding the extraterrestrial presence and related phenomena, and/or 2. support convening congressional hearings to take testimony from scores of former military and agency employees regarding extraterrestrial phenomena, and/or 3. formally acknowledge to the American people the extraterrestrial presence - Disclosure, and/or 4. release into the public domain extraterrestrial derived technologies, secretly studied and reverse engineered for six decades, and now essential to overcome the environmental, economic and societal challenges of our time. 5. Whatever else you feel moved to include. Additional Information 1. Important. Send your letter / fax / email as soon as possible. The greater the early correspondence the greater the media attention which will create more correspondence. 2. Feel free to copy your congressional representatives in the House and Senate. 3. Paradigm Research Group will aggressively publicize the sending of these letters, faxes and emails to the President to attract media attention. So let PRG know you sent something by emailing [email protected] 4. The Million Fax on Washington will also encourage letters / faxes / emails from citizens of other nations since all are affected by the Truth Embargo. 5. A Facebook Group Page has been created for "Million Fax on Washington." Spread the word to your Facebook friends. President Barack Obama - the White House The Honorable Barack Obama President of the United States 1600 Pennsylvania Avenue NW Washington, DC 20500 [Standard business size envelopes only please.] Fax: 202-456-2461 Email via: www.whitehouse.gov/contact [Note: emails are limited to 500 characters, but that is more than enough to make the key points.] Should I call the White House ? You can also call the White House and leave a comment at 202-456-1111, but do this in addition to writing a letter, fax and/or email because these leave a record and the collective correspondence can be more easily reviewed. Important. Please notify Paradigm Research Group at [email protected] when you send a letter, fax, and/or email to the President Elect. This will help PRG to generate media interest in this effort. Some Examples Of Letters Already Sent To Washington Extraterrestrial presence on our Planet for as long as recorded history and other paradigm rattling truths about our reality and who we are will change the world ... and we shall collectively co-create the new earth of Peace & Oneness ... where anything is possible ! A World where all exist as ONE celebrating the authentic power of love and oneness !